While I was in the Yuma area it had started getting unseasonably warm, like in the 90's, so I decided to head north and find more temperate weather. 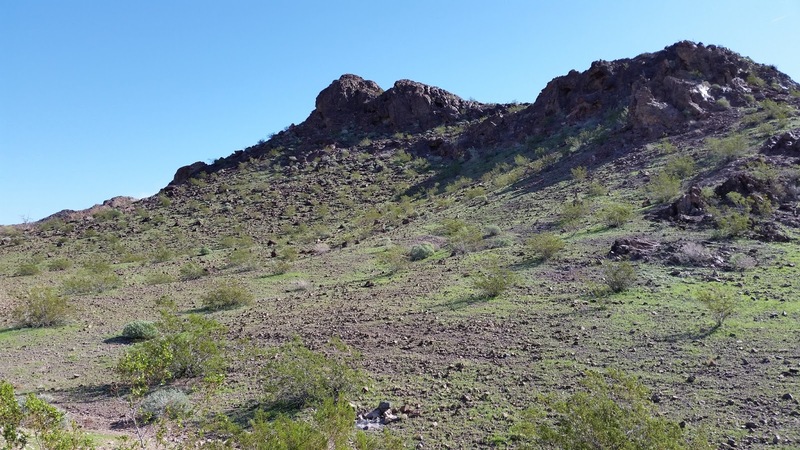 About two miles north of Lake Havasu City off AZ Highway 95 is the turnoff to Craggy Wash, government land managed by the BLM. The road in is pretty rough but if you take it slow it's not too bad and after a mile or so you come to the start of the approved camping areas. The beginning of the camping area at Craggy Wash. This time of year in Arizona almost all the BLM land is pretty heavily populated with snowbirds and Craggy Wash was no exception. 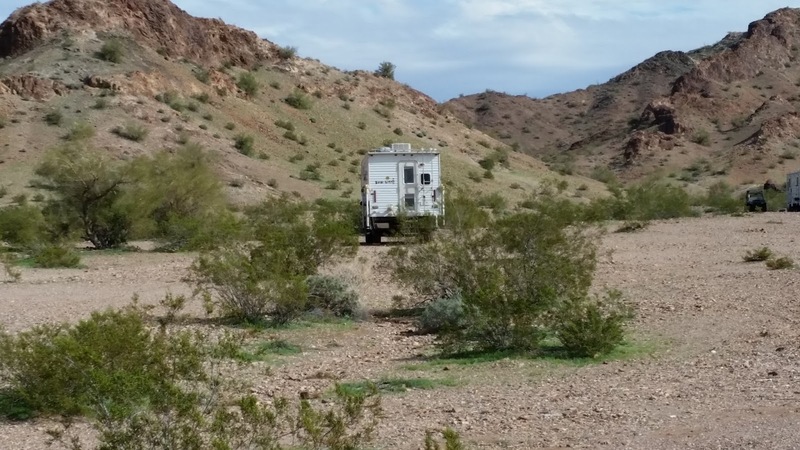 I pulled into the first vacant campsite I saw with the intention of parking the Tank there and walking around looking for an upgrade site as the one I grabbed was pretty close to the road in and would be subject to traffic noise and dust. 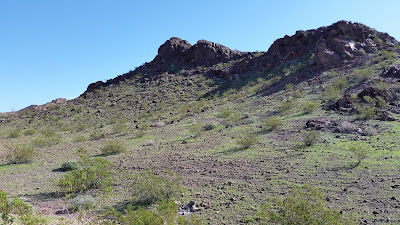 There are two main camping areas at Craggy Wash, the first is a wide open space you encounter just past the above sign, then further along the road back into the hills are dozens of camp sites along or just off the road going back at least two or three miles. I chose a "permanent" spot at the very back corner of the wide open space that was pretty far removed from the road. 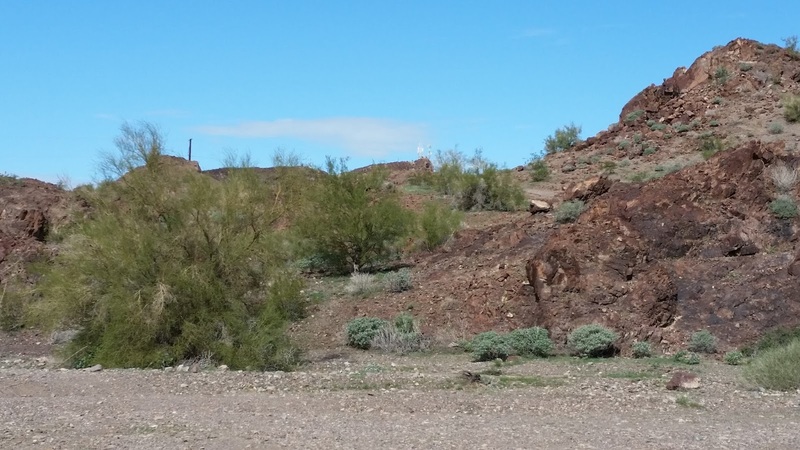 The Tank's Craggy Wash site after scouting it on foot. Lake Havasu as seen from the Craggy Wash access road. 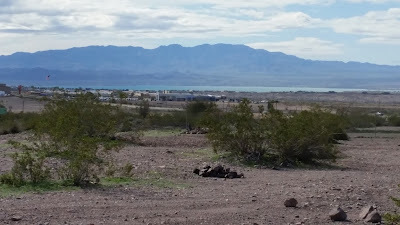 It's a little unusual to find BLM camping so close to a good sized city and there's a Walmart Super Store just a mile and a half south of the Craggy Wash access road off AZ 95 that a lot of the folks camping there frequented. I had stocked the Tank up there before getting to Craggy Wash but it was good to know if you ran out of anything you didn't have far to go to replenish. If you squint at this picture you can just see the cell tower next to the camp sites. On my walks I walked the access road back into the hills and saw some pretty nice camp sites but most were situated so that there was a hill (or small mountain) between the sites and the cell tower that provides the main area where I was with excellent Internet reception so I guess that might prevent me from venturing too far away from the main area where I was. One of Craggy Wash's "crags". My black tank lasted the first 12 of my 14 days which forced me to regrettably have to shorten my stay at what I really found to be a pleasant camping experience. There was a Canadian guy and his girlfriend (there were LOTS of Canadian license plates at Craggy Wash) who camped near me and they were a musician/singer kind of act and they put on impromptu concerts at night with guitar, mandolin and singing...kind of cool! 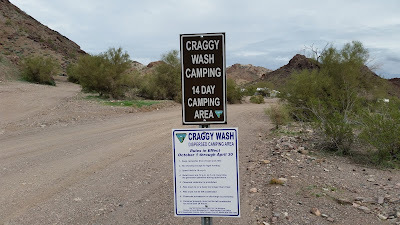 I'm adding Craggy Wash to next year's camp rotation, it was a very nice camping experience and I really recommend it!